Check out our free 5 star rated food recipes. Wynn Resort Casino in Las Vegas, Nevada has a 110,000 square foot casino gambling floor with 2,000 slot machines, 165 table games, race and sport book, large poker room, 18 hole golf course and hotel with spa. 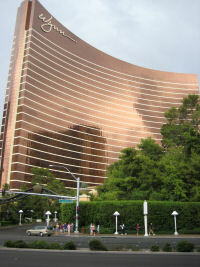 The Wynn Casino Resort is one of the newer five star casino gambling resorts on the strip and every detail is stunning. Mr. Wynn did not spare any expense and it is truly a fabulous first class resort. This is one of the few casino resorts in the world that has both a Mobil 5 Star and AAA 5 Star rating. Just walking through the Wynn Resort and admiring the quaint shops, cafes and architectural details is an entertainment venture within itself. Table games: 165 tables playing all the popular games. Sportsbook: Enjoy the excitement of a Las Vegas sports book in the comfort of a lounge setting. The Wynn Spa has all the treatments ranging from body massages to facial treatments. Imagine this, a championship 18 hole golf course located on the strip. We recently saw some of the course and the waterfall from the monorail, but we have not yet had the opportunity to play the course. You must stay at the resort to play the course. OurFavoriteCasinos.com only provides information on the gaming industry and free of any online control. YOU are responsible to ensure that you meet all age and regulatory requirements before making a wager.